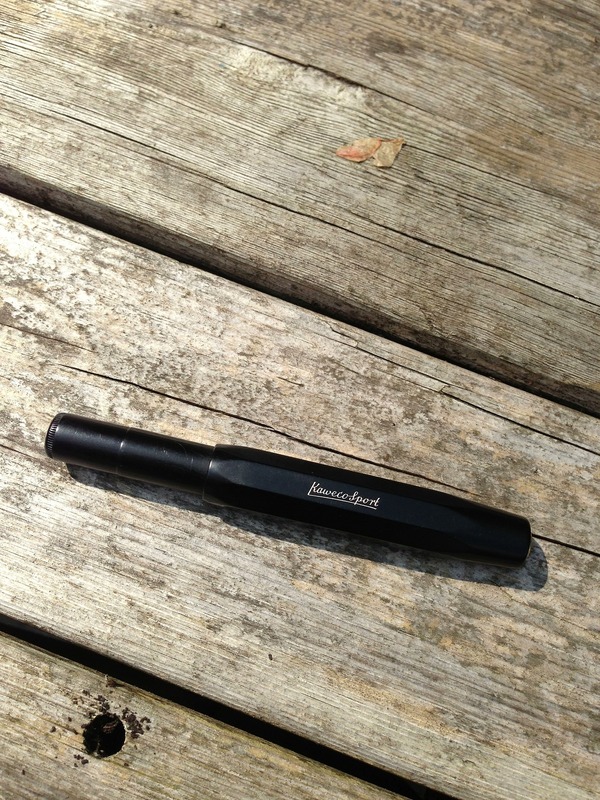 Kaweco Classic Sport fountain pen review – Pens! Paper! Pencils! 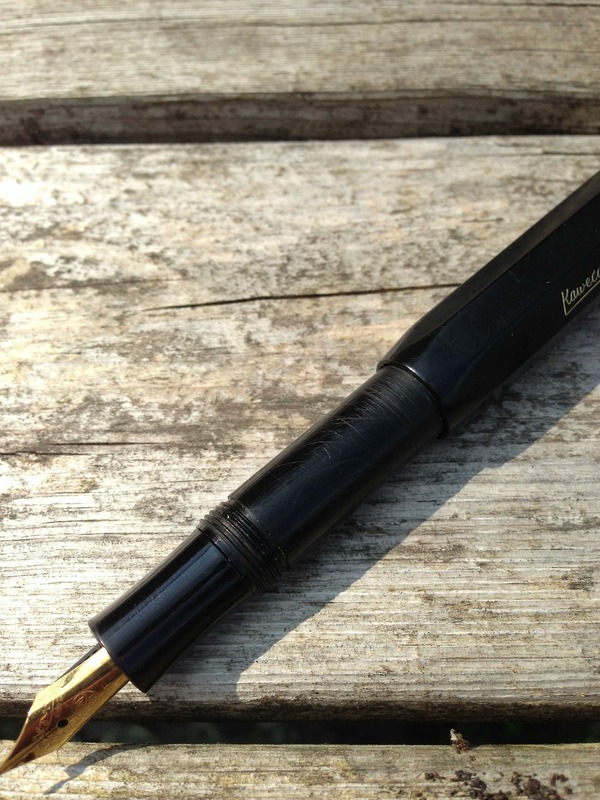 The Kaweco Classic Sport is the pen I keep in my pocket. This in one pocket, a Pilot Colelo Lumio in the other. It is the perfect pocket fountain pen. The lid screws on so it doesn’t come off unless you want it to. with the lid on the pen is very small. Pocketable, even. Posted, it’s very comfortable to hold. Being plastic, it’s light and fairly cheap, so it’s not the end of the world if it gets lost. However it is not without its faults. I use this pen a lot and the combination of a screw-on cap, the necessity of always needing to use it posted and it being made of plastic means my Kaweco Classic Sport is pretty beaten up. I don’t mind it with this pen but others might (and I would hate it if this wasn’t my pocket pen). There is nothing special about this ink. I received some Schneider Black cartridges with another pen so I thought I’d try it out. It’s a pretty dark ink, which is how a black ink ought to be. More often this pen is filled with Diamine Onyx Black or Pelikan 4001 Black. I find it easiest to syringe fill an empty (short international) cartridge. There is a convertor available: it holds virtually no actual ink. 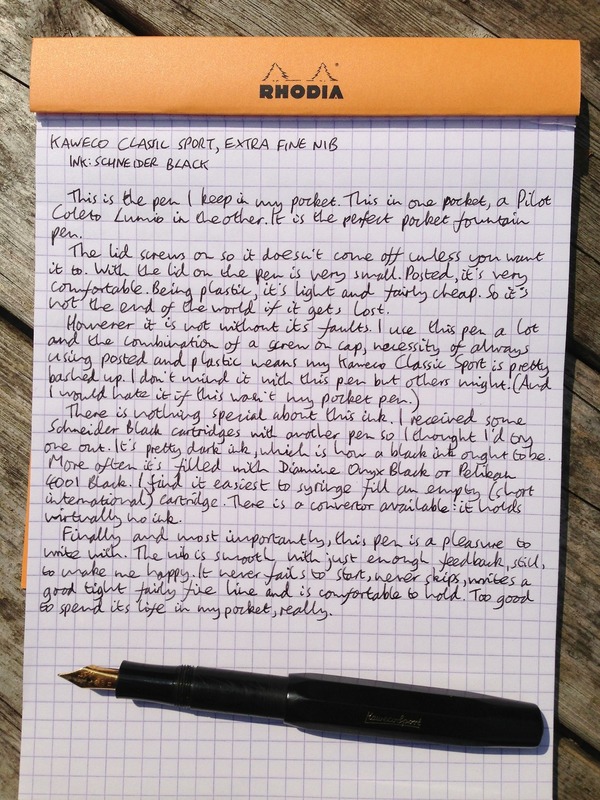 Finally and most importantly, the Kaweco Classic Sport is a pleasure to write with. The nib is smooth with just enough feedback, still, to make me happy. It never fails to start, never skips, writes a good tight fairly fine line and is comfortable to hold. Too good to spend it’s life in my pocket.